NIGHTMARE ON MOORE STREET: The weekends blockbuster of a storm inflicted a seemingly random pattern of blows on area homes. This particular stroke of fate was delivered across the street from Princeton High School. Heavy rain along with wind gusts up to 70 miles per hour toppled trees, knocked out power, and flooded basements here, there, and everywhere. 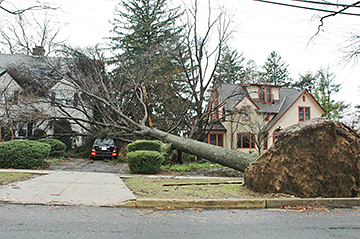 Felling trees and flooding basements, inflicting power outages and road closures, Saturdays storm caused almost everyone in central New Jersey some degree of inconvenience as a result of the heavy rain and driving winds. A partnership between New Jersey Transit and local municipalities could result in a Bus Rapid Transit (BRT) system replacing the much-beloved Dinky train shuttle connecting the Princeton Junction station to a site on campus. Three Township candidates are vying for two seats in the coming School Board election on Tuesday, April 20. Finance Committee chair Dorothy Bedford is running for reelection, and newcomers Molly Chrein and Afsheen Shamsi have tossed their hats into the ring. Current Board member and Township resident Joann Cunningham, who is a member of the Personnel and Program committees, has chosen not to run for reelection. Princeton University President Shirley Tilghman called for a robust dialogue between scientists, social scientists, and humanists during her talk, The Meaning of Race in the Post-Genome Era. Sponsored by the Center for African American Studies, the James Baldwin Lecture featured Ms. Tilghmans take on how scientific discourse has affected how people imagine race and racial categories over time. Cheryl Stevens climbed up Mt. Kilimanjaro last summer in training for her senior season with the Princeton University womens basketball team.